Above are the very first Sesame Street toy puppets from 1971 made by Educational Toys Inc. Shown here are (L to R) Ernie, Bert, Oscar the Grouch, and Cookie Monster. Educational Toys Inc. made the first series of Sesame Street toy puppets in 1971 and 1972, offering Ernie, Bert, Oscar the Grouch, Cookie Monster (shown above) and a doll-like Big Bird Stuffed Puppet which had a plastic beak and plastic legs. 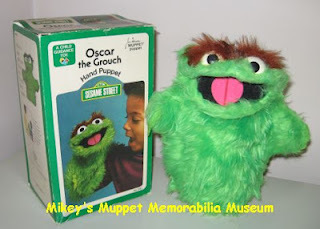 The Cookie Monster and Oscar puppets offered by Educational Toys were made in Jamaica. 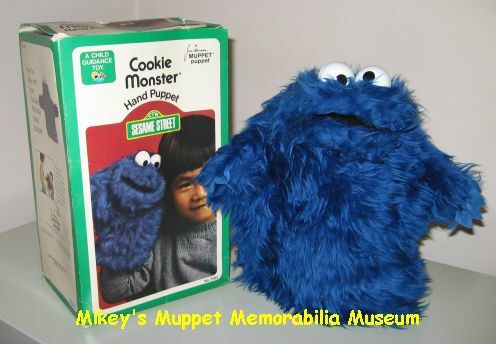 The Cookie Monster puppet was also made in Canada. This was likely done simultaneously with those made in Jamaica. The Ernie and Bert shown above do not have makers tags on them, so it is unknown if they were made in Jamaica, Canada, or the United States. The box shown below for Ernie does not have any makers information other than "Educational Toys Inc." on the inside next to Ernie's right elbow. The side of the box shows some awesome artwork of the Sesame gang playing with puppets. Only bert is holding the puppet of himself! (Click on the image to see it full size) The box shown here is missing the background artwork that lined the box behind the puppet. 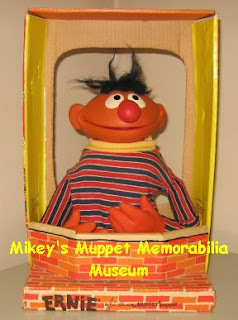 I've also seen a smaller sized box for what looks to be the Educational Toys Ernie puppet that is the same open style, but has an illustration of Ernie on the top flap and a white base under the wall section instead of brick. I've never seen the smaller white boxes up close to check the markings, so until then I can't say 100% that they are from Educational Toys. I'm guessing that the box shown above is the United States version and the smaller box is the Canadian version. In my experience the smaller box is less common. Here are the only makers marks on the box. 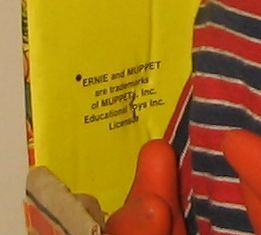 It says "ERNIE and MUPPET are trademarks of MUPPETS Inc. Educational Toys Inc. Licensee"
The back of the box had a punch-out section allowing it to become a puppet booth, designed to look like a TV set. I've found that when boxes turn up on e-bay or at nostalgia shows, they are ususally in this "played with" condition which reduces the value considerably. Above is the Educational Toys version of the Roosevelt Franklin puppet. With help from David of "Grover's Corner" (here is his blog: http://vintagesesamestuff.blogspot.ca/) I've managed to identify which copy of the Roosevelt puppet I have. 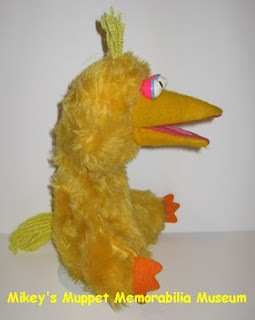 As with the Ernie and Bert puppets, Educational Toys' Roosevelt puppet was made with the black iris section of the puppet's eye sculpted so that it is raised slightly above the white section. Roosevelt's arms were also left unstuffed. 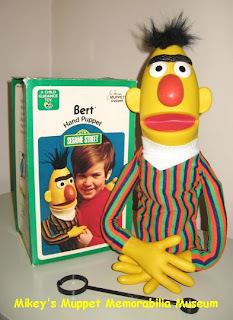 The Child Guidance version of this puppet simply has flat painted irises, and the arms have a slim foam tube inside similar to Bert. Child Guidance also made a version of this puppet with a slightly smaller head than the original Educational Toys version. 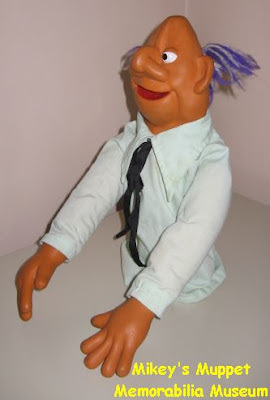 Vicma also made a version of this Roosevelt puppet in the late 1970s using pink plastic for the head instead of purple. Roosevelt Franklin was included as one of the main Sesame Street Muppets to be marketed in the 1970s. The character had his own record album, a PVC figure, the above hand puppet, a finger puppet, a Fisher-Price Little People figurine, and also made appearances in several children's books, but by the 1980s was dropped from toy lines as well as the TV show. For this reason, it's often assumed that Roosevelt is a rare puppet in this series. 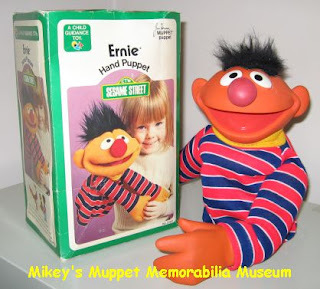 However the Roosevelt hand puppet was produced from 1972 or 1973 through to at least 1977, so the puppet itself is not rare, but finding one in the original box can be more of a challenge than finding a boxed Ernie or Bert. I find it's funny how tiny Roosevelt's hands are compared to the other "plastic head" puppets in the series. 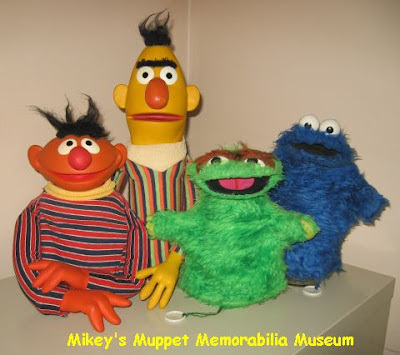 These are some of the Child Guidance Sesame Street puppets made between 1973 and 1979, all mint from the box. Shown here are (L to R) Ernie, Bert, Oscar the Grouch, Cookie Monster, Big Bird, and Grover. 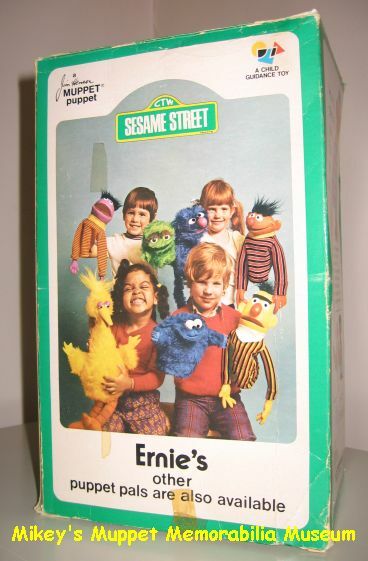 Child Guidance took over the Educational Toys line of Sesame puppets in 1973, offering their own modified versions of all six products, including Roosevelt Franklin. It's my understanding that Child Guidance also expanded the series at this point in time, adding Grover to the series, as I have never seen this character in the Educational Toys packaging. Above is the back of the 1973 Child Guidance box showing four kids holding the first seven products available in this collection. This image was only used on the boxes until early to mid 1974, after which the boxes were changed. The Ernie and Grover puppets shown below are from this earlier wave. Note the "Jim Henson Muppet Puppet" logo on the front of the box is in the top left corner and the Child Guidance logo is in the top right corner. 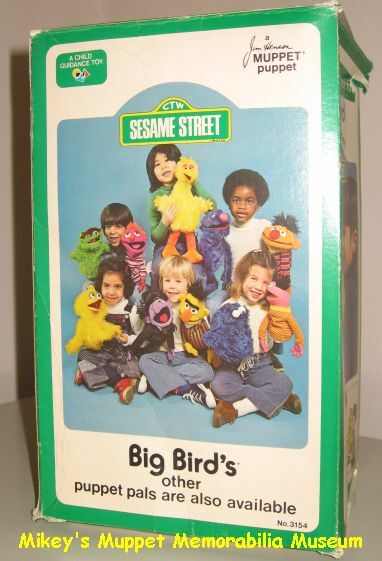 The boxes from mid 1974 and onward have switched the logos around so that they are in opposite corners, and a green box has been added around the Child Guidance logo (see the Oscar box below in the 1974 section for comparison). 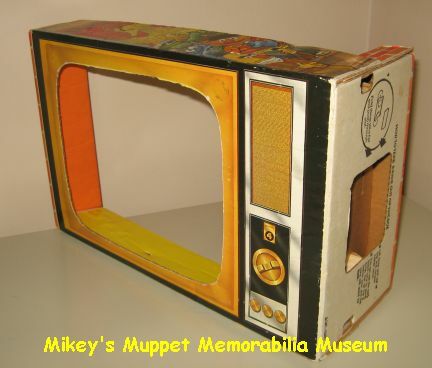 The only box that doesn't match with this concept is the one for the Anything Muppet puppet (shown below), as it was offered in 1974 with the 1973 style box. 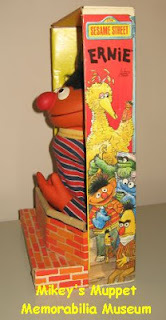 The picture on this Child Guidance box for Ernie shows the Educational Toys version of the puppet. The back of the box also shows the Educational Toys puppet. 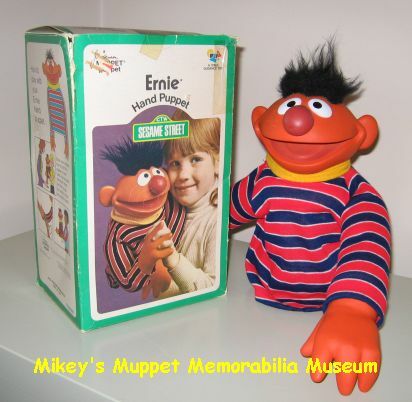 Next to the box is the actual Child Guidance puppet which is very different (note the shirt stripes). The Child Guidance "plastic head" Ernie puppet was made from 1973 to 1977. 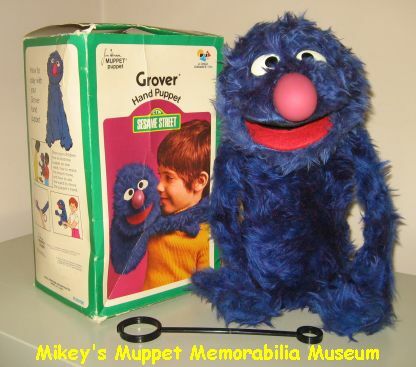 Below is Grover's box from 1973. This puppet was made several years before Fisher-Price made the Rowlf the Dog and Animal puppets for their Muppet Show series of toys. All three of these puppets are very similar in style, with plastic heads covered with fabric and a plastic nose. 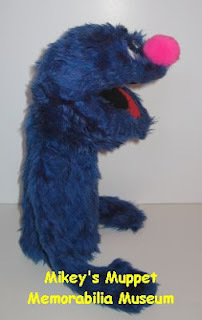 I wonder if perhaps this Grover puppet influenced Frisher-Price's design for the Muppet Show series? Child Guidance produced this Grover puppet from 1973 until 1978 or 1979. The image below shows the back of the boxes that were used from mid 1974 to mid 1977. This revised box (with five kids instead of four) introduces The Anything Muppet and The Count to the series. This photo is also the only time the correct Child Guidance "plastic head" Ernie puppet is ever seen on Child Guidance boxes, as the 1974 Ernie box still used the Educational Toys picture for the front (the same one seen above on the 1973 Ernie box). 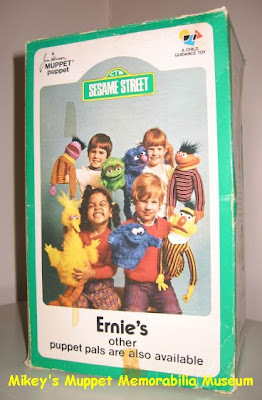 Therefore, the actual Child Guidance "plastic head" Ernie puppet was never pictured on the front of the boxes. 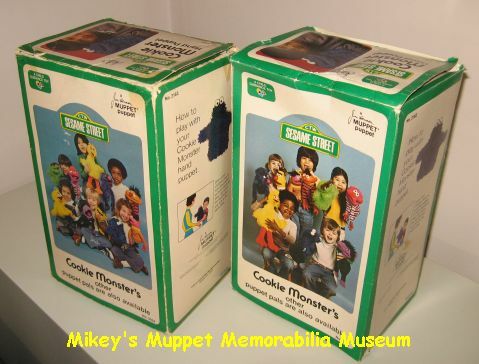 The Oscar the Grouch, Cookie Monster and Bert puppets shown below next to their boxes are all from 1974. All seven items shown on the back of the 1973 boxes can also be found in 1974 boxes. 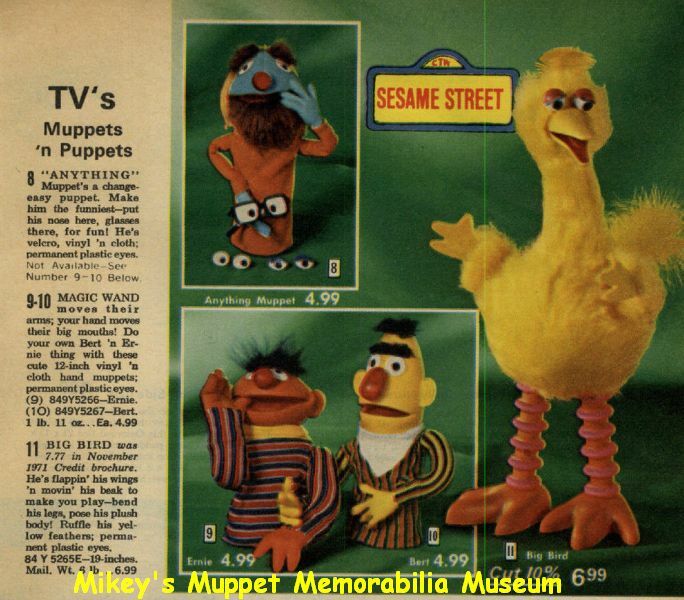 The Anything Muppet is advertised in the 1974 Child Guidance catalogue (shown above) as being a new addition for that year. It came with a variety of face pieces (eyes, nose, hair, etc.) so that kids could create their own character. This puppet is hard to find with all of the pieces. Often when this puppet turns up on e-bay or at a flea market it doesn't have any pieces at all. 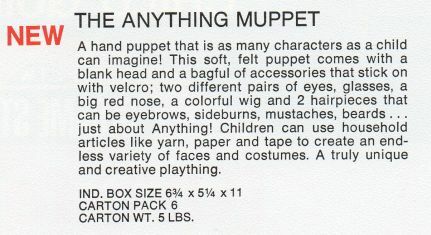 Above is the description of the Anything Muppet from the 1974 Child Guidance catalogue, with a list of all the pieces that the toy came with. The Child Guidance Anything Muppet as shown on the back of the 1974 box (left) and the 1977 box (right). 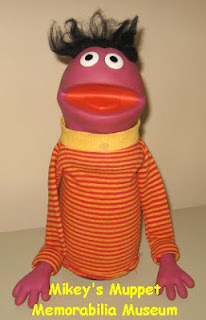 Note that the stripes are horizontal as compared with the puppet seen in the above 1974 Child Guidance catalogue photo, which has vertical stripes. Although the 1974 Child Guidance product catalogue listed the Anything Muppet as being "new", the 1973 Eaton's Christmas catalogue included the above photo of the Anything Muppet on page 460. This blue version is clearly a prototype as it looks nothing like the toy that was actually produced. Not a single component of the puppet pictured here is the same as the actual toy puppet! The puppet's face and hands should be pink instead of blue, his shirt is made out of Ernie's shirt fabric, and the eyes and hair are all completely different, though I like how much this blue prototype looks like a hippie! In any case, in order for Eaton's to have filled their customer's orders for Christmas 1973, Child Guidance would have had to have made the Anything Muppet available in late 1973, rather than releasing it in 1974! The other interesting thing about this photo is the yellow arm rod on Grover. To my knowledge all of the arm rods were black plastic. Here's another look at a prototype for the Anything Muppet. This one is an even earlier version from the 1972 Aldens catalogue. Note that the listing says it's "not available". Very bizarre! Why include it in the catalogue if it's not available? Once again the character is blue instead of pink, and he also has brown fur pieces and yellow hair that was not included with the final product. His shirt is a solid orange instead of striped. As this is a 1972 ad, could it be that this is the Educational Toys prototype for the Anything Muppet which Child Guidance later finished developing for a 1974 release? 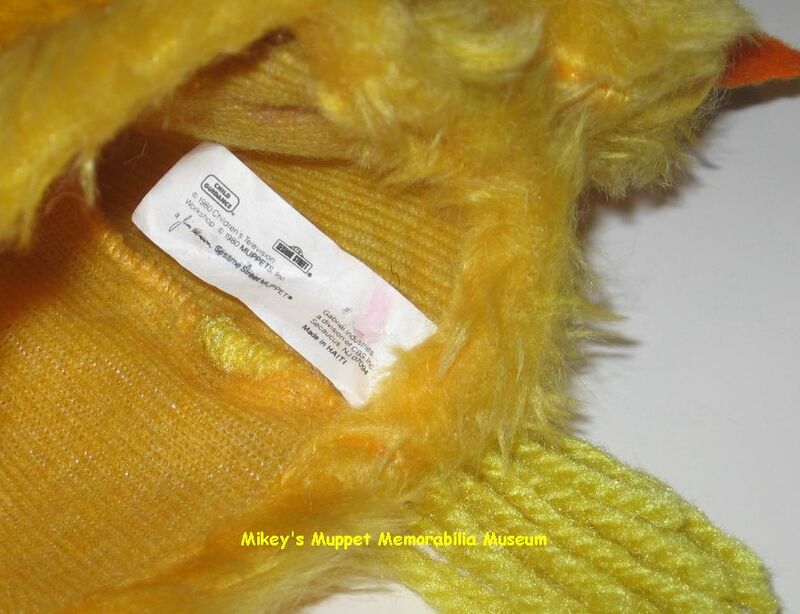 The puppet sleeve on this Anything Muppet prototype is much longer than the one shown above, which is typical of the Educational Toys puppets. This is definitely the Educational Toys Big Bird (the listing says it was available in Nov 1971) and what looks to be a smaller variation of the Educational Toys Bert with the fabric eyebrows. In any case this is a very interesting advertisement! of the 1974 box (left) and the 1977 box (right). 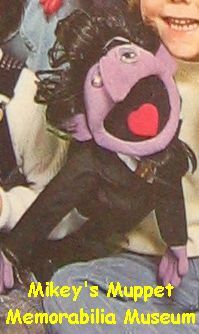 The Count was not mentioned in the 1974 catalogue however a unique version of the "fabric head" Count puppet appears with the Anything Muppet on the back of the revised box packaging for 1974. Therefore, the Count was likely added to the series sometime in 1974 or 1975. 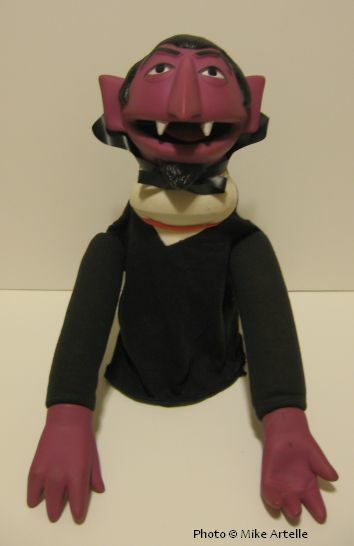 The version of the Count puppet seen in the 1974 box had fake fur hair and is likely a prototype, which is too bad as it looks a lot better than the actual puppet that was made. The actual product was pictured on the 1977 boxes and has doll like hair. This in my opinion is the worst puppet in the series. I still don't have the "fabric head" count puppet in my collection and I'm not in any rush to change that. I've deliberately passed it up at flea markets a few times. Next are the boxes for 1977 (with six kids) which introduce the Big Bird Hand Puppet. 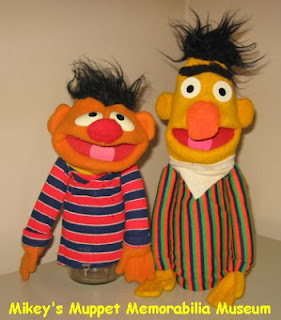 The "plastic head" version of Ernie and Bert were also replaced with the cheaper, less interesting "fabric head" puppets. It's strange that Roosevelt Franklin is now the only puppet with a plastic head. (It also seems that Roosevelt is now pink instead of purple. Vicma also made avery different version of Roosevelt that was pink.) 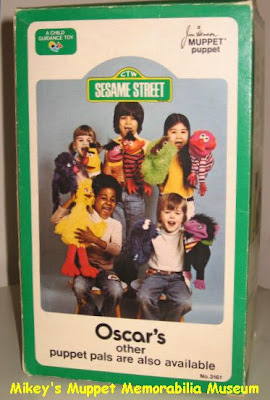 The Count puppet on the 1977 box has been changed to show the actual product that was sold. In this picture, the pieces of the Anything Muppet's face were changed from the 1974 box photo. This time the puppet doesn't have a moustache. Most of the same kids from the 1974 box are back to hold up the puppets again. 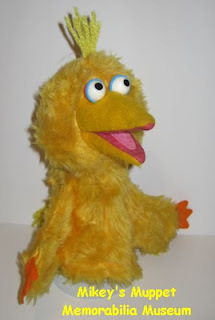 This Big Bird Hand Puppet is awesome! I like it the best from this series, even more than my plastic head Count puppet. 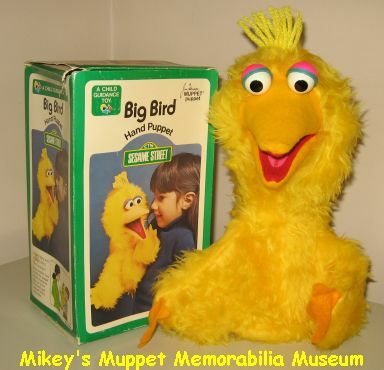 I got one of these Big Bird puppets for Christmas when I was very young and was fascinated with it, so I'm really glad to have found one in the original box. Unfortunately the plastic used on the inside of the puppet to shape the beak and hold the eyes in place has dried out and become very brittle. In fact it's so fragile now that I hate to even move it as the plastic has already broken in a few places (it snaps even if you barely touch it!). As a result, one eye is now loose, so the eyes may have originally been closer together than they are in the photo. In order to take this picture, I stuffed the head to give the puppet some shape and to keep the eyes in place. Here is the box for the "fabric head" Ernie puppet. I bought this from e-bay and when it arrived it had a "plastic head" Ernie in the box. I don't know if Child Guidance packaged them this way or not. Perhaps when they were making the transition from the "plastic head" type to the "fabric head" type some puppets were put into the wrong boxes? 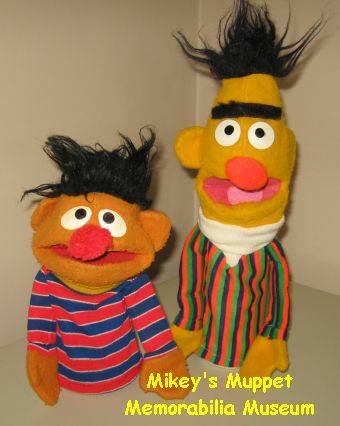 Child Guidance Sesame Street "fabric head" Ernie and Bert puppets from 1977. 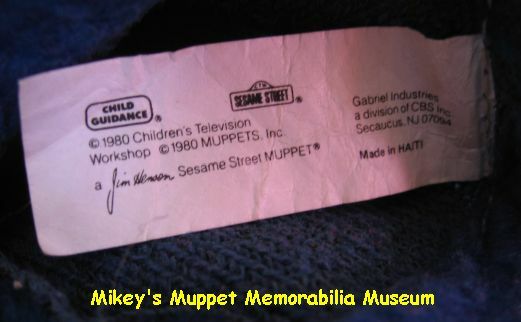 It seems that these "fabric head" Ernie and Bert puppets were made until at least 1980, as the Ernie has a tag that says "Gabriel Industries a division of CBS Inc." with a copyright of 1980. It was made in the United States. Unfortunately the Bert puppet doesn't have a tag. I stuffed both of their heads to give them shape for the photo. This 1977 Cookie Monster box is identical to the 1974 box only it has the updated picture on the back. 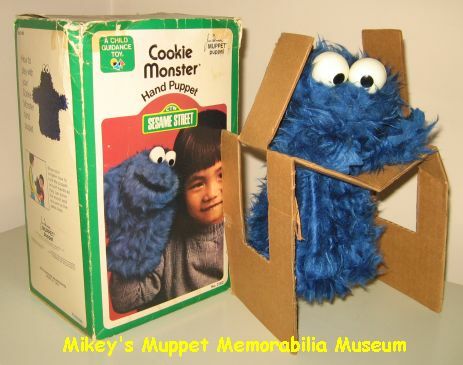 Therefore, Cookie Monster has three box variations, and I assume, so do all of the original items from 1973. The card board insterts (shown above) for these boxes are often missing. Here are both of my Cookie monster boxes. On the left is the 1977 box (with six kids), and on the right is the 1974 box (with five kids). I'm missing the 1973 Cookie Monster box (with four kids). No, I'm not a Muppet! I'm Monsieur Tranquille!!! Although not a Muppet collectable, I thought this was worth posting here for a few obvious reasons. This is a toy puppet of Monsieur Tranquille displayed next to a record album that shows what the actual puppet character looked like. Monsieur Tranquille is a popular character from a French language Canadian TV show that aired on CFTM 10 in Montreal during the 1970s. The character was performed by puppeteer Eric Mérinat. The toy puppet shown above is missing the moustache, eyebrows and glasses. It was made in Taiwan by Les Entreprises NSB INC and distributed by Les promotions Atlantiques INC. Both the toy puppet and the record album are from 1977. 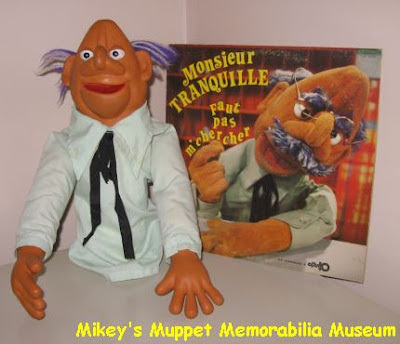 Here is a side view of the Monsieur Tranquille toy puppet. He has a very big nose and his yarn hair is glued on (as were his missing eyebrows and moustache). His glasses were made out of wire. Obviously, this puppet was made in the same style as the Child Guidance Sesame Street puppets which had become very popular by 1977, the year this toy was made. Although Monsieur Tranquille is not a Muppet, collectors of the Child Guidance Sesame Street puppets might be interested in adding this unique puppet to their collections because of the similarity in style, and because it is from the same time period. From my experience this puppet is not easy to find. Here are the Vicma puppets in a photo from the Muppet Wiki website. I figured since the Muppet Wiki site "borrowed" one of my Sesame puppet pictures without asking, I could do the same and "borrow" one of theirs (though I supose they just took it from someone else!). Unfortunately Muppet Wiki doesn't provide the sources for images. Think about that. A database style website that doesn't provide source information!?! 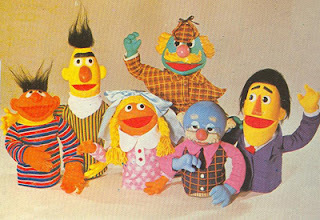 For international markets, additional puppets for the Sesame Street series based on the Spanish edition of Sesame Street, "Abrete Sesamo," were made by Vicma in the late 1970s. These included Guy Smiley, Betty Lou, Proffessor Hastings, Sherlock Hemlock as well as variations of the Child Guidance Ernie, Bert, Roosevelt Franklin and Grover. Vicma also made Oscar the Grouch and Cookie Monster puppets that were completely different from the North American version. Characters from "1 Rue Sesame" in France to be made as puppets for this series, also by Vicma, included Toccata (a white bird with a plastic orange beak), and Mordicus (a blue monster similar to Grover). In Mexico a different toy company, Lily Ledy, produced Abelardo (an orange crocodile) and Paco (a green parrot) from "Plaza Sesemo" as hand puppets with plastic heads in the 1970s. A Herry Monster puppet was added to the series at some point in 1978 and is quite hard to find, especially in mint condition. The Herry puppet was likely only available in stores for one year before the toy was discontinued in 1979 or early 1980. In 1980 Hasbro took over the production of the Big Bird Stuffed Puppet, though by now it was no longer a puppet and was simply a doll with a moulded plastic beak. Hasbro offered two different sizes of their Big Bird doll, as well as a talking version, all of which were available until the mid to late 1980s. Here is the complete set of six CBS Toys/Child Guidance Sesame Srteet puppets that were made in 1980. In 1980 CBS Toys took over the series and continued producing cheeper fabric versions of Ernie, Bert, Big Bird, Grover, Cookie Monster and Oscar the Grouch. By this time, all other characters in the series had been discontinued (Roosevelt Franklin, The Count, Anything Muppet, and Herry Monster). Here is the CBS/Child Guidance Ernie and Bert hand puppets from 1980. They are quite pathetic though I find they have more personality than the fabric head count puppet. I had to stuff their heads to give them shape for this picture. The Ernie puppet shown here is the one I played with as a child so he is in very poor condition compaired to the Bert puppet, which I found on e-bay and is almost mint condition. Here is the CBS/Child Guidance Big Bird hand puppet from 1980. 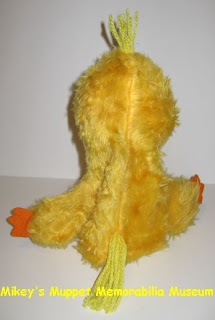 It has a fabric head without the plastic shape in the beak (as was done for the original Child Guidance Big Bird hand puppet). This one has orange felt hands, but I've also seen this puppet with yellow felt hands. The tag says "Made in Haiti" the same as the above Grover puppet. I've stuffed the head a little to show the shape. Below is the back view and the tag. If you want to read the tag, click on the image to make it bigger. Here is the CBS/Child Guidance Gover puppet from 1980. It has a fabric head without the plastic shape underneath (as was done for the original Child Guidance Grover puppet). The nose is a pom pom glued on. The tag says "Made in Haiti" (see below). I've stuffed the head a little to show the shape. 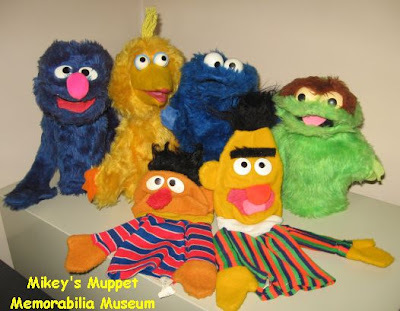 In Italy yet another company, Harbert, produced their own version of Ernie, Bert, Cookie Monster, Grover and The Count during the 1980s. By the late 1980s all of the Sesame Street puppets had been discontinued. They were followed by the Applause line of Sesame Street hand puppets which are completely different and new products. Therefore, if you just count the Sesame Street characters that were offered as puppets during in the 1970s, there are 18 puppets in all in this collection... or 20 if you include the non-Muppet Monsieur Tranquille and the unidentified blue mouse character. Glad you enjoyed the collection. I'm not sure why your Ernie puppet is wearing a hoodie. Maybe the previous owner added it? I really like the Fisher-Price Scooter too. They did an awesome job on those Muppet toys. All the best. Thanks Mike for these pics and links about Monsieur Tranquille! Please note that the pupeeter of Monsieur Tranquille was Roger Giguère. The character was created in 1976 for the TV series "Patof voyage" (CFTM-10, Montréal), then he hosted his own shows in 1977 and 1978. Monsieur Tranquille is also known for the disco hit "Madame Thibault", for which he received a Gold Record in 1977. You will find additional infos on my Wikipedia article, search for "Monsieur Tranquille", thanks! I have the Educational Toy Inc. Ernie with the box still intact. I am tempted to punch out the back of the box because it says the instruction booklet is behind the paper background. I would love to see what it looks like and what it says. You have great information on it and was wondering if you knew where else I could read about the puppet. Anything would be greatly appreciated! Glad you liked my blog. I've noted everything that I know about these puppets here, and have never come across a mint condition Educational Toys Ernie box other than seeing pictures. So what you said about the instruction book is news to me. I would be tempted to open it too! However, if I were in your shoes I'd leave him in the box. Maybe someone will read this who has seen the booklet and post some info for you? Anyone out there have a web link to share? There must be something, somewhere online about that booklet. Sorry I don't have any more info for you. Your Ernie sounds like a great find though. Thank for posting a message. Yes, my mother Peggy was President of the Ottawa Puppetry Club for many years. She remembers you and the puppet skit that you did with Grant. The Puppet Club has been inactive for a few years now, but Peggy and I still make puppets. We have a website called Artelle Puppets which can be found at www.artellepuppets.ca along with our e-mail if ever you wanted to contact either of us. Your Count puppet looks awesome! I'd love to see it up close sometime. You did a great job fixing him up! Hope you don't mind me asking this, but if you ever decide to sell him someday please call me! All the best. 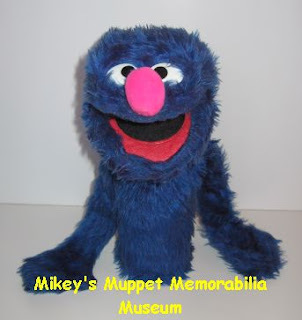 Hi I would like to know how much the original Ernie, bert, franklin, cookie monster, and grover sesame street puppets are worth, a rough estimate would be great! Please get back to me as soon as possible, I would really appreciate it! Thank you so very much! Hi Alexa So sorry for taking so long to respond. Unfortunately I don't really keep track of the values. It would really depend on the condition (how played with they are). The puppets are worth considerably more if they are in the original box. E-bay has made these puppets very easy to find loose, so I wouldn't expect them to be very costly, maybe $20 to $30 for a loose puppet that is still in reasonably good shape. 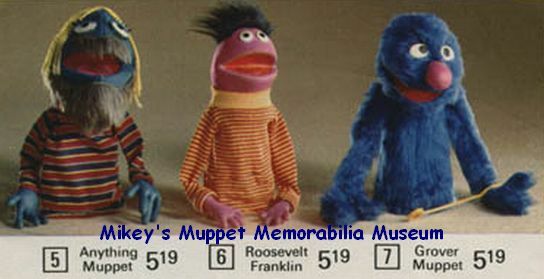 Ernie, Bert and Cookie Monster are the most common puppets to find from the series, so Roosevelt may be priced a bit higher, say $40 but it's also not a rare puppet as is often suggested. They were all mass produced for at least five years in the mid 70's. The only genuinely rare puppets from the collection are Herry Monster and the Count with the sculpted plastic head. Some collectors may want specific manufacturing variations of the puppets, but I wouldn't suspect that to affect the price unless they had the original box. All the best! Just found an Ernie puppet the other day,sadly without his right hand.Which as a puppeteer,who doesnt usually have a "right hand" to work with,I found kind of funny. But awesome collection! I was curious, I found a 1974 Now Playing Anything Muppet show marquee; did this come with a/the puppet(s)? I haven't seen any information mentioned either way anywhere. Hi lily Gosh, I'm stumped! Not sure what item you're referring too, doesn't ring any bells for me. Now I'm very curious! If ever you check back and read this, please post some more info, maybe we can figure this one out? Yep, it was packaged with the "Anything" Muppet pictured above. A much coveted piece not easily found. 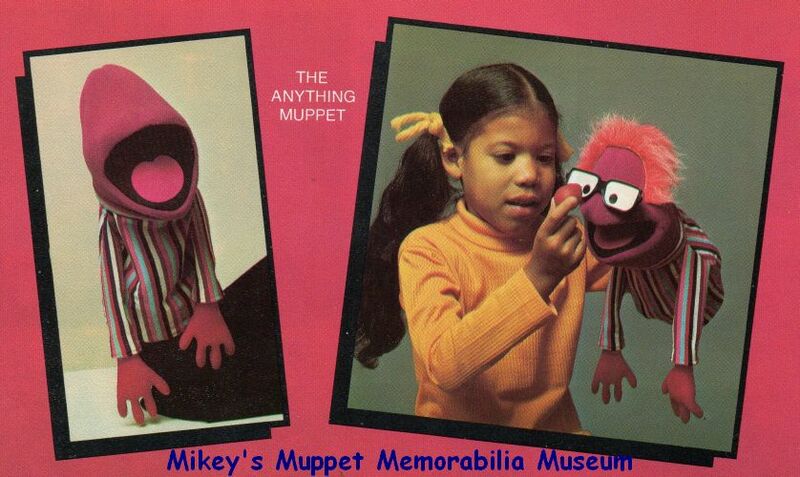 As Mikey stated, the puppet is usually found without any of its many accessories. Does anyone have a photo of this item? I'd love to take a look! I really want the rare plastic headed Count Puppet! Yes it's a very cool toy! So very strange that they didn't keep it in production longer considering how popular it is with Sesame fans. Hope you find one! Long time reader, and learner. Thanks for that. I just joined the ranks of count puppet caretaker. So, you know there's at least one more out there, now. The reason I'm writing is...I see all sorts of conversations about the puppet, but no one ever mentions the molds for heads/hands. Does anyone have ANY info on these things? Who made the very first Muppet Show Toys of my favourite character? 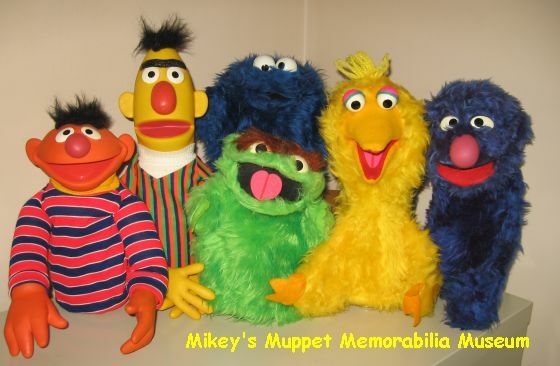 Mike Artelle has been actively collecting Muppets since the age of nine when he owned his first Kermit the Frog puppet and became a fan of "The Muppet Show". "I used to wear my Kermit puppet everywhere, to school, to the swimming pool at the park, to the dinner table. During the winter I wore the puppet as one of my mittens. For fun, I even used to draw with a pencil in his mouth, we were inseparable. I Hope you enjoy viewing this blog. Please feel free to share comments." All photographs and texts are copyright Mike Artelle. Picture Window theme. Theme images by i-bob. Powered by Blogger.